Discover one of travel’s final frontiers, where the people, creatures and landscapes are like nowhere else on the planet. 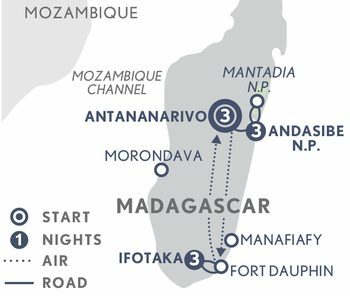 This comprehensive journey takes in five distinctly different regions, and offers diverse experiences of Madagascar’s wildlife, history and tribal culture. You’ll see the country’s most important national parks, where many varieties of lemur exist, the charming capital Antananarivo, and Ifotaka in the south for wildlife and cultural experiences with the local Atandroy tribe. Low Season: From $6,970 per person twin share. High Season: From $7,700 per person twin share. Arrive into the quirky Malagasy capital Antananarivo (Tana) and transfer to your charming city hotel. Day 2: Tana – Andasibe National Park. This morning you are driven to the Andasibe National Park. The journey is a gentle introduction to rural life in Madagascar, passing rice fields and roadside stalls selling seasonal fruits. Andasibe is home to a large variety of lemurs, birds, reptiles and invertebrates. Day 3: Andasibe National Park. This morning, visit the Analamazaotra Reserve with a local guide. This 810-hectare reserve protects the largest of all lemurs, the indri. Look for some of the remaining 11 species of lemur that live here, including the grey bamboo lemur, common brown lemur and diademed sifaka. Bird watching is also excellent. A guided night walk will reveal some of the nocturnal species found here. Day 4: Andasibe National Park - Mantadia National Park - Andasibe National Park. An estimated 80% of this park is virgin forest, home to a multitude of species of lemurs, chameleons and birds, as well as an incredible array of orchids, pandanus and giant ferns. Hike along the forest trails today on the look out for the diverse flora and fauna. Enjoy a picnic lunch in the park and see the Rianasoa waterfall. Day 5: Andasibe National Park – Tana. Morning at leisure. This afternoon you are driven back to Tana. Day 6: Tana – Ifotaka. Transfer for the flight to Fort Dauphin and on by road (approx 3 hours) to Mandrare River Camp in the Ifotaka region. This secluded, classic tented camp offers guests easy access to the unique spiny forest, where an abundance of fascinating wildlife exists, and opportunities to encounter the Antandroy tribespeople who call this otherworldly landscape home. This afternoon, head out on a walk to the sacred community forests filled with the ancestral tombs of the local Antandroy tribe. Two days to enjoy all the activities on offer. Drive to the sacred forests, home to an abundance of wildlife, in particular large groups of ring-tailed lemurs. Visit nearby markets to see the rich tapestry of valley life. Travel to the forest of Zenavo, a rewarding spot for night walks and head out in search of sifakas and sleeping white-foot sportive lemurs. Day 9: Ifotaka – Tana. Transfer (approx 4 hours) to Fort Dauphin airport for the return flight to Tana. Transfer to your hotel. Transfer to the airport where your Madagascan adventure ends.